1) In a 3 quart iron Dutch oven, toast the spices on medium heat until aromatic, about 3 or 4 minutes. 2) Add broth and simmer about 15 minutes. Then strain liquid through cheesecloth into another pot or bowl. Wipe pan out. 3) Heat sesame oil until hot, add onions and cook until translucent. Add garlic and ginger and cook, stirring, until aromatic. Add mushrooms to pan and cook until done. Add the broth back to pot. 4) Heat the pho broth. Meanwhile bake salmon, at 295, for 9 minutes. Place in bowls you are going to serve the Pho in. 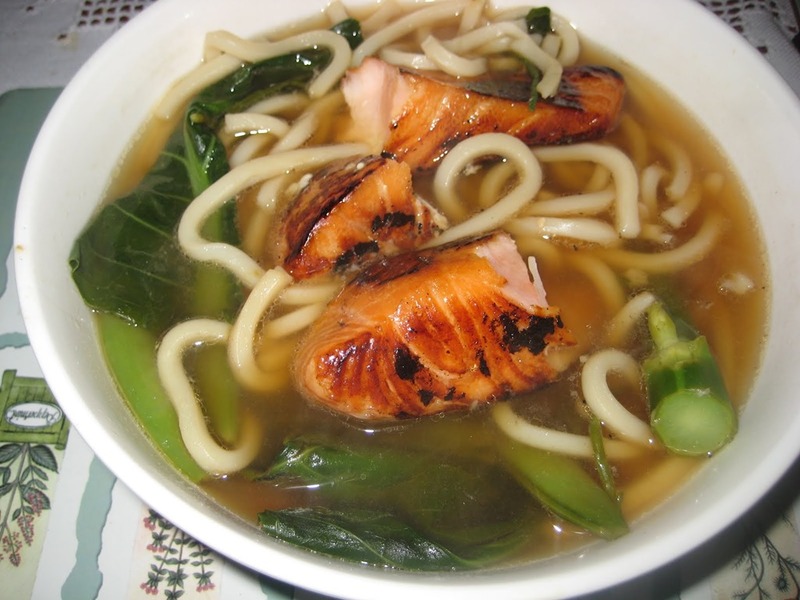 5) Add spinach to broth, let wilt, scoop out with slotted spoon and add beside salmon in bowl. Repeat with mung bean sprouts. 6) When ready to serve, pour hot broth over bowls, dividing the veggies evenly (onions, mushrooms). Top with cilantro and serve.